Description Of Item: Build your favorite TRANSFORMERS hero, BUMBLEBEE, in vehicle or robot mode with this 2-in-1 set of 335 KRE-O construction pieces! Includes 3 KREON figures: BUMBLEBEE, RED ALERT and Driver! 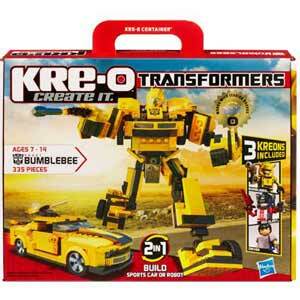 2-in-1 KRE-O construction set lets you build BUMBLEBEE as a robot figure or as a sports car! In robot mode, convert wings on BUMBLEBEE figure into a glider for KREON figures to ride on! In vehicle mode, up to 2 KREON figures can ride inside the sports car! Set includes 335 KRE-O pieces and 3 KREON figures.